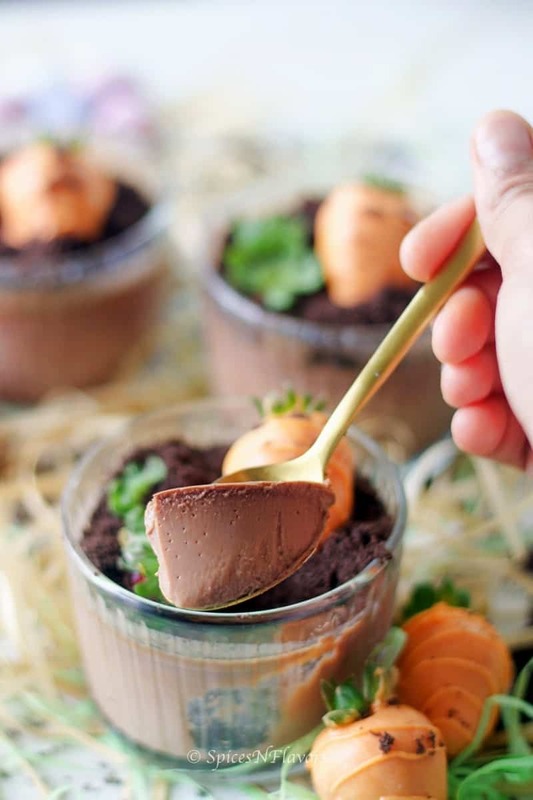 Don’t be surprised if I say you just need 4 simple ingredients to make this ULTIMATE Instant Pot dessert – A dreamy, smooth, silky and chocolaty Instant Pot Chocolate Custard. 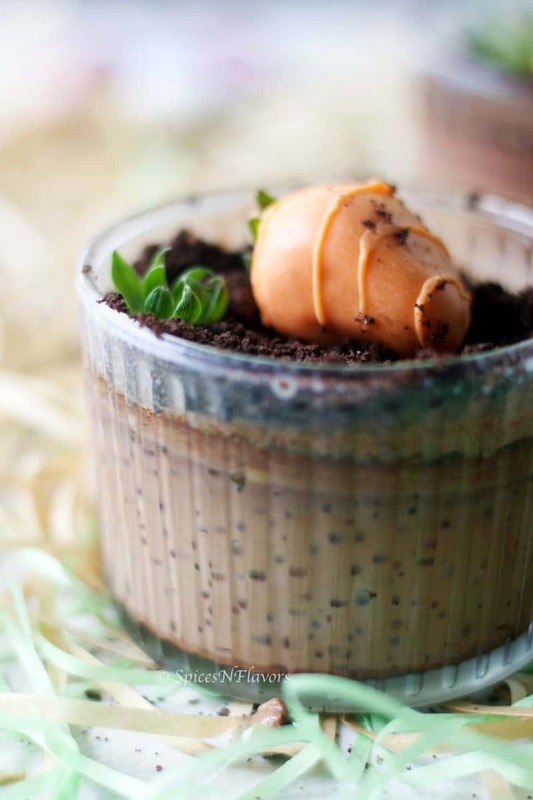 Top it with some soil (not literally) and some strawberry carrots and you have the perfect dessert for your Easter table – Carrot Patch Custard. Even though Easter is something that I have not celebrated growing up, living in a foreign land I now appreciate all the festive and holidays and enjoy sharing it with my little girl. 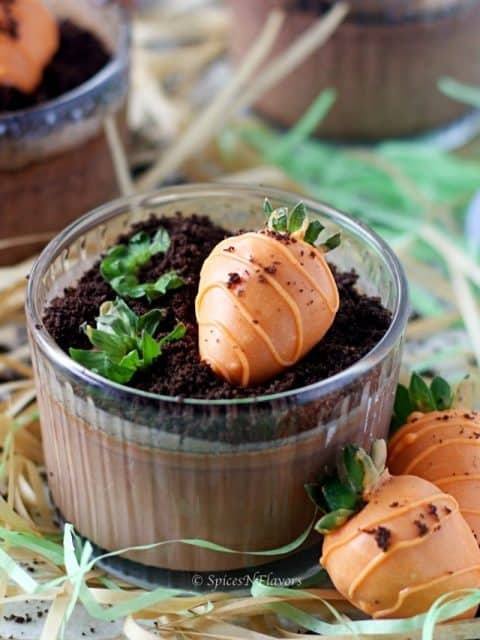 Each year I have been sharing something special and unique on this little space here and this year is no different – a quick and easy chocolate custard recipe with those little extra decorations on top is just so pretty. Don’t you all agree? How to make Instant Pot Chocolate Custard from scratch. How to make this instant pot egg custard using stove top method. How to make Chocolate Custard at home from scratch? Custard is basically cooked milk or cream, sweetened with sugar and generally thickened using egg yolk. Other setting agents like cornflour (cornstarch) or even gelatine can be used for the same. And so it is fairly easy to make custard recipe at home. Well on a stove top method you will have to keep on stirring everything and also maintain the right temperature to cook it to the perfect creamy stage and not make scrambled eggs instead. And there comes our Magic Pot. 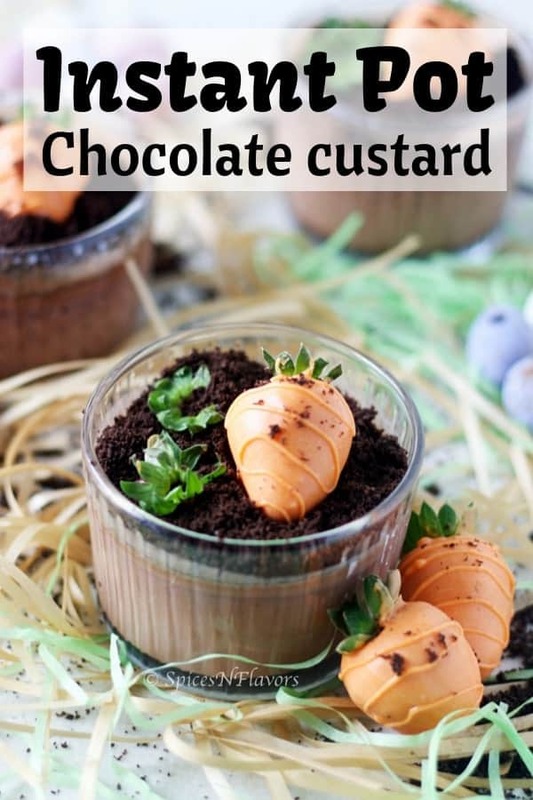 Why I prefer using Instant Pot to make Chocolate Custard Recipe? No babysitting whatsoever – totally eliminates the need of stirring the saucepan. Maintains even temperature, unlike the gas top. No need to worry about burning or splitting the custard due to overcooking. So what is Chocolate Custard – simply adding chocolates to your basic custard recipe. I understand some of you guys do not eat eggs or do not like the smell of it in custard recipes so you might be wanting to try an eggless recipe. While making the Alphabet Cake, I had used an eggless custard recipe so you can check that by clicking the link. Basically, if you are wondering how to make chocolate custard with cornflour or how do make eggless custard? So that is the answer right there so we use cornflour or cornstarch as our thickening agent while making a custard without eggs. 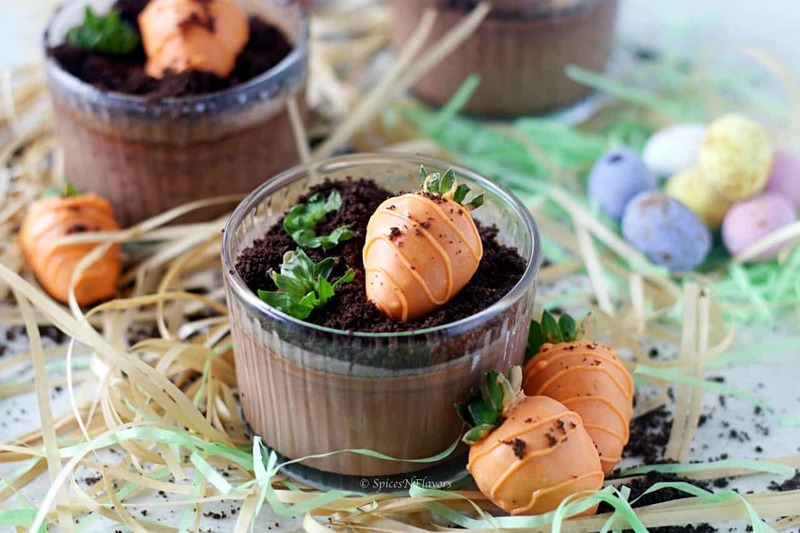 How to make chocolate custard without cornflour? – Then you will definitely have to go for Eggs as your thickening agent or use gelatine. Cornstarch: To Use it or Not? Well, there is not much of a difference between either. However I feel that the custard made using eggs is so much more smoother and rich due to the additional fat from the yolks than the ones made using cornstarch. Again its a personal preference both of them turn out pretty good. 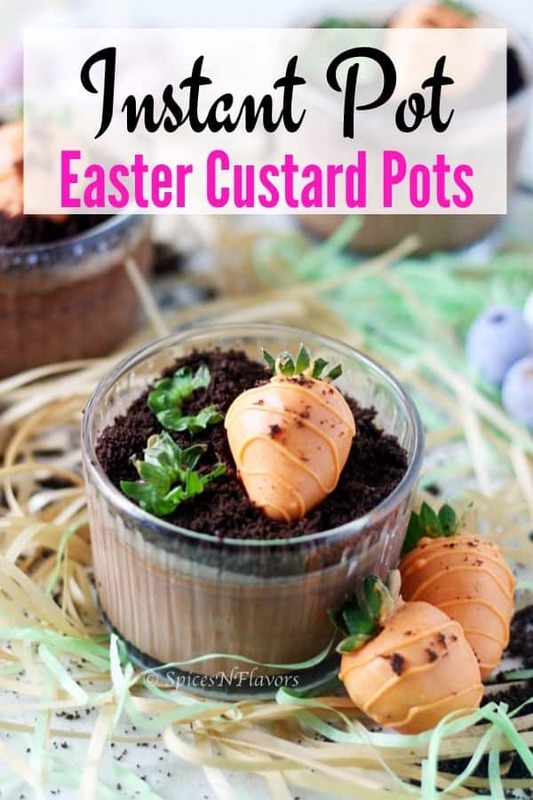 Let me share with you all My 4 Top ways of using this basic instant pot custard recipe. I have made the basic custard recipe couple of times and used it in a plethora of other recipes to further enhance the taste and also to come up with a all new recipe. 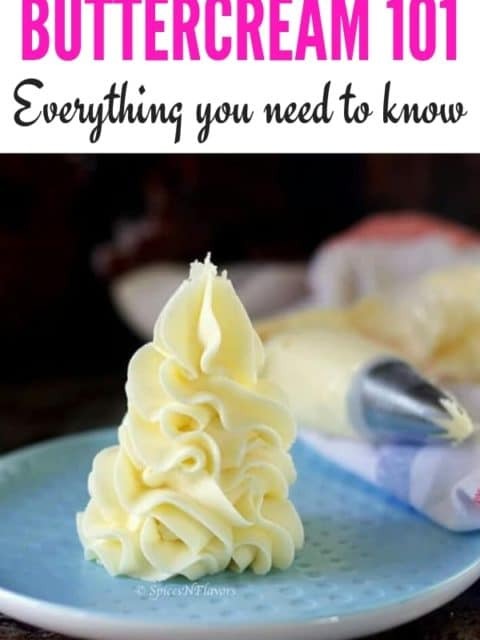 Now you have to understand a basic thing here: custard may vary in consistency from a thin pouring sauce to the thick pastry cream to be used as a filling. Depending upon that let me share with you all some ideas. Just like the trifle, the thick custard can be used as a filling in your cake too. This would go even well with a mousse cake. So a layer of chocolate cake, chocolate mousse, chocolate custard and also feel free to add a chocolate ganache layer.. Woah.. now that is a Death by Chocolate Cake. For that you will have to first make the chocolate tart base, then add chocolate custard layer topped with chocolate ganache. An ultimate chocolaty experience. Make the chocolate custard and then add it to your softly whipped cream and whip it until thick. 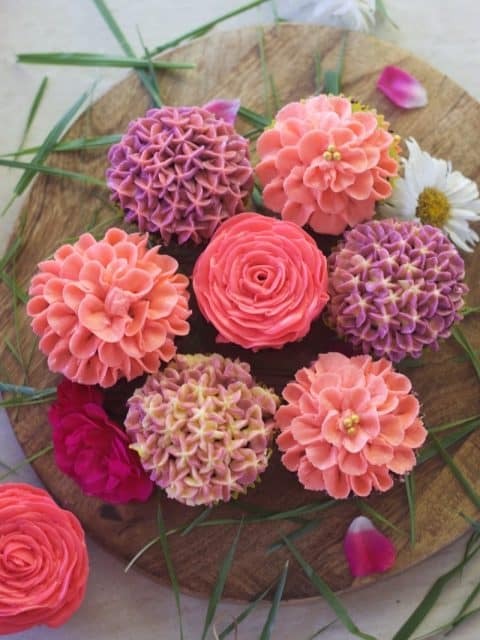 You can also add it to your Condensed Buttercream Frosting. So yum!!! With Easter around the corner, I have used this method to make a Carrot Patch Pots. Won’t it look stunning on your Easter menu? Let me know what your thoughts are in the comments below. Now when I did my Level 4 Bakery Course the one thing that we all were taught was about perishable goods and egg being on the top list. We have stored custard for a day in refrigerator and used it the next day but never did we freeze it. Even all over the internet you will find that it is a big NO NO. However, I found this particular site that had a successful attempt at freezing them. Since I have never done it personally I cannot comment more on frozen custard but you could check that site by clicking the link and see if you would want to go by that route. 4 ingredients and 3 mins of pressure cooking - nothing can get simpler than making a chocolate custard in the instant pot. Perfectly smooth and creamy this custard is to die for. Chop the chocolates finely and transfer to a bowl. In another bowl add in the eggs, sugar and essence. Beat for 2-3 mins until combined. Now stirring the chocolate mixture continuously and with constant speed transfer the egg mixture to the chocolate mixture and mix until combined. Filter the entire mixture atleast 2 times to get a smooth consistency. Transfer to the ramekins to 3/4th of its height. Cover it loosely with aluminium foil. To your instant pot add 2 cups of water. Place the trivet and place these ramekins on top. Close with the lid. Turn the knob to sealing position. Set the timer to 3 mins using pressure cool or manual button. After the timer goes off. Let it depressurize for exactly 10 mins and then do a quick release to release out any pressure. Open the lid and take the ramekins out. The custard would have a slight jiggle which would set completely on cooling. Let it sit at room temperature for 20 mins and then chill in the refrigerator for 4 hours. Simply grind 6-7 oreos along with the cream in your food processor or mixer. In a microwave safe bowl, add chocolates, oil and food colour. Microwave for a minute with 15 sec interval until the chocolate is all melted and mixed. Transfer to a small glass so that it is easier to dip the strawberries into it. Start dipping one strawberry at a time by holding the top leaves in between your fingers for grip. Allow the excess chocolate to drip off before placing it on a tray lined with parchment paper or silicon mat. 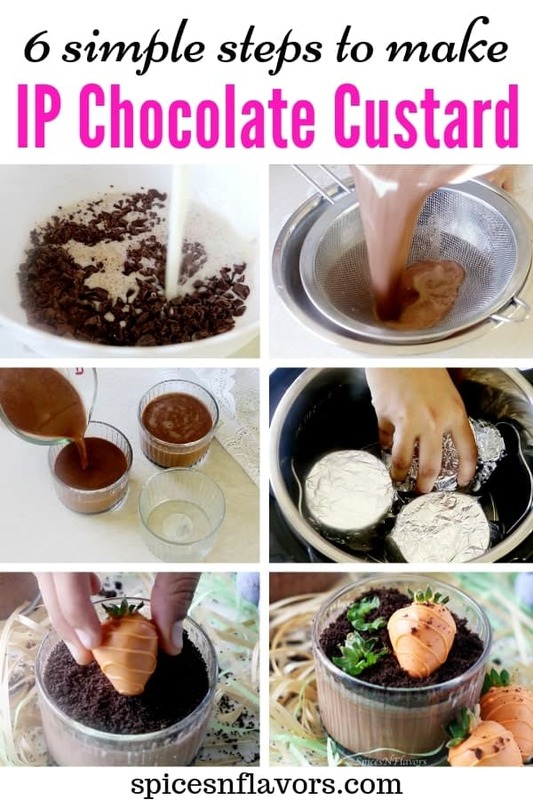 Since the strawberries are cold straight from the fridge the chocolate would set immediately. Transfer the remain chocolate to a parchment paper cone. Draw zig zag lines on top of the set chocolate to create character to the carrots. Allow to set too. Take the chocolate custard out of the refrigerator. Pat with kitchen paper to collect the condensation if any. 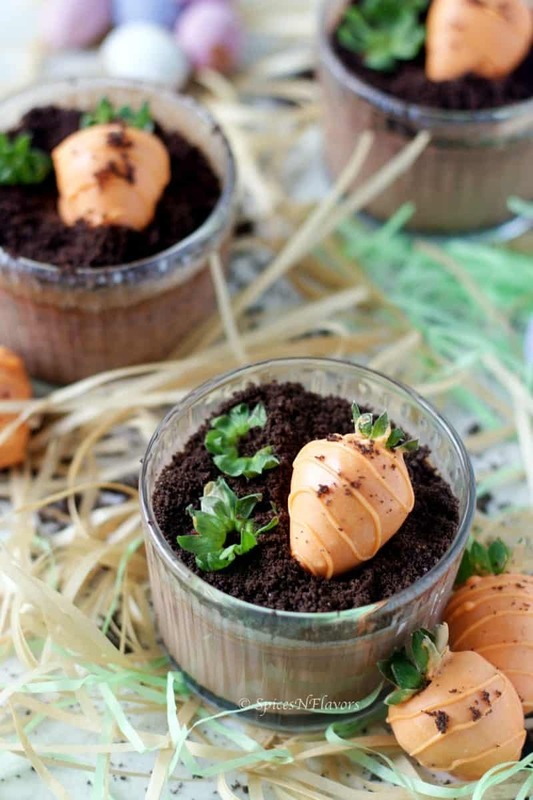 Add the oreo soil on top and place the carrots. Now on the other side place just the leaves of the strawberries indicating that the carrots are yet to be harvested. To the carrot on top, add in some oreo soil to indicate that it is just taken out from the ground. 1. In place of dark chocolate, you can also use semi-sweet or milk chocolate. In that case, adjust the sweetness. 2. This dessert is mildly sweetened to increase the sweetness increase the amount of sugar by 1 tbsp I like to add vanilla essence to mask the eggy smell. It is optional you can skip if you want to. 5. The ramekins that I have used is 8 cms in diameter and holds 3/4 cups of water so it took me 3 mins for this recipe. If you are using the standard white ramekins which is smaller than this one please use 2 mins timings in that case. 6. With this recipe, I could make 4 ramekins of the above-mentioned size. If you use the standard small white ramekins you could make up to 5. 8. This Instant Pot Chocolate Custard stays good for 2 days in the refrigerator. 9. If you are looking for Stove-top version of making custard then here is the link. This Instant Pot Chocolate Custard is a smooth and creamy dessert that is not literally melt in your mouth. However, it is totally silky and smooth. Since it is not overly sweetened you could finish off the ramekin at one go. Honestly, I ate 2 at a time 😉 as I could not resist the chocolaty goodness. So what I am trying to say is that it is not rich and you could easily finish off one portion at a time. And as it is perfectly set, you can carry it to potluck parties or even to your office. 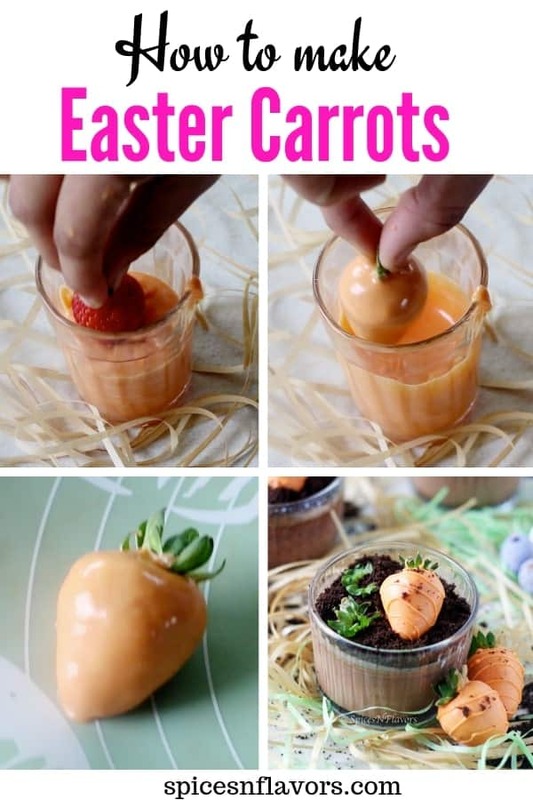 Did you like the idea of making Carrot Patch Pots for Easter? If yes then let me know in the comments below. 23 Easy Indian sweet that you can make in under 30 mins. I hope you enjoyed this post. If you did do let me know by tagging me, tweeting me or Instagram me. I would love to follow you and your posts. I will see you soon in my next one. 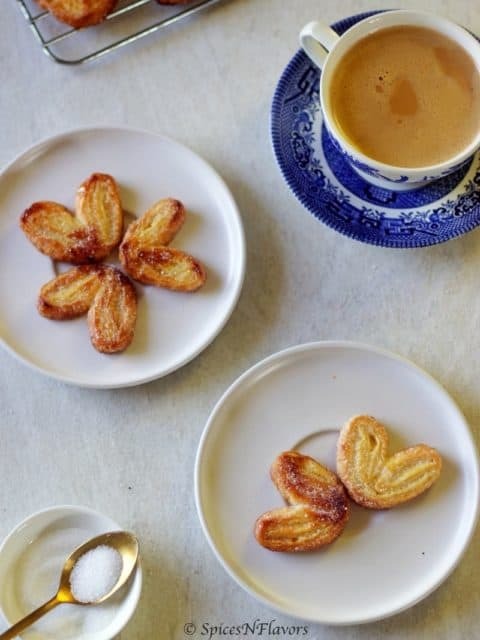 This looks wonderful, we have company coming tonight and this will be a perfect dessert. Thank you so much for sharing and for the video, you explained it perfectly!